I work with a bus spotter. I nearly crashed my bike on a Audax perm a few week back looking at a Scottish diesel engine crossing the Ribble Valley lol. The grass verge saved me ! I never did find out what diesel engine it was though I noticed what looked like it was hauling about 20 open containers of wooden logs, something I've not seen before. How geeky is that ! That might not be a trainspotter, they could be a twitcher photographing the penguin on the stairs. More to the point, why is TimO crouching down in the foreground? Probably a Class 66 running the Carlisle-Chirk timber train via Ribblehead for Colas Rail. I think it could have been. It had the new Scottish livery with large decals. There were several examples of the species thermos anorakus lurking at Eaglescliffe station when I rolled up today. I asked one of them what was coming through. "The Hogwarts Express," he replied, and he'd obviously committed some sort of faux pas, judging by the gasps and sucking of teeth from the others. 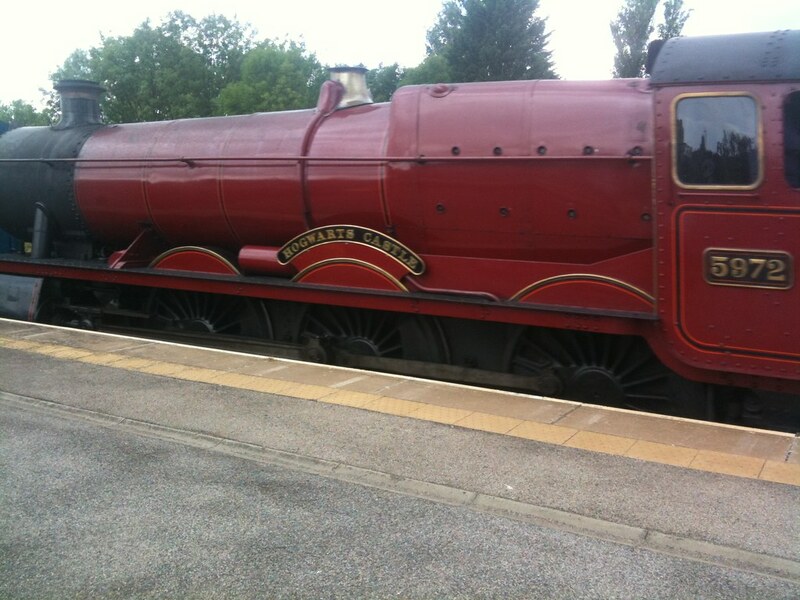 As well as the Hogwarts Express, it was the Mallard, being transported to Teesport for shipping to Germany. Even I've heard of that. Go and sit on the geek step for 10 minutes.. 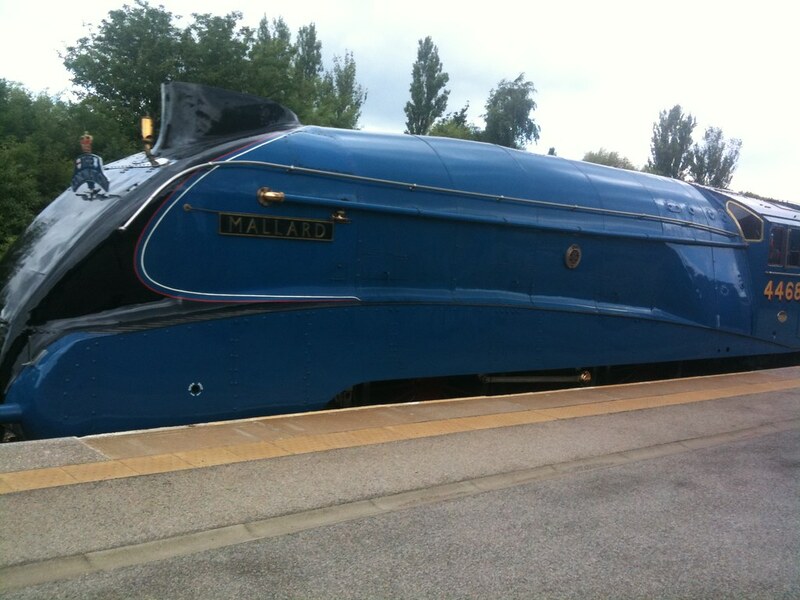 When are we going to get her back at the NRM! It's to be displayed alongside the German machine which held the speed record for a month or two. Show those bally Krauts what for. Ah, cheers. Seems she'll be back in October. It's not quite same without her. I have to admit that I can be a bit of a sailing boat spotter especially racing ones and old gaffers. I do it because I kind of understand how they work and am thus interested in their history and how people kit them. I don't take photos but when I spot one, I will try to approach and have a look. I would imagine that trainspotters have similar motivations. I've seen 7 Bromptons today. I failed to note all their colours, but two were all-over black. Didn't get the frame numbers. The British railways are still using about a hundred 08 shunters built in 1953 to 1962, making them up to 58 years old. What great longetivity. Funny how they can only do 15 or 20mph, but that's all that's needed for shunting. Also funny how how they look nearly like steam engines. Are these the oldest locos still in regular use on the UK's proper railways (excluding heritage stuff)? My info is from Wikipedia. I've got some of the interest of a train spotter, but not the knowledge or desire to collect numbers. Also funny how how they look nearly like steam engines. Whereas an engine designed for shunting has just the one cab, and a reversing lever. That's not trainspotting, that's art. Did you hear the programme on the radio earlier about a chap collecting dust from various buildings around the world? I couldn't work out if it was a spoof. Here's one of mine - one of those 'spur of the moment' shots taken when I was wandering through York Station. Given that my house backs onto the ECML, seeing a Class 66 is a bit 'meh', but one stabled in the station less so. Since it's summer, there've been quite a few kettles running back and forth along the mainline, most likely the Scarborough Spa Express. No radio, I'm working today. Ah, so you can't do whatever you like on a heritage railway? ps. Please don't forget to answer my question on the 08s. Are they the oldest locos still used on the proper railways? Pretty much, yes, if you rule out main-line certified steam locos.